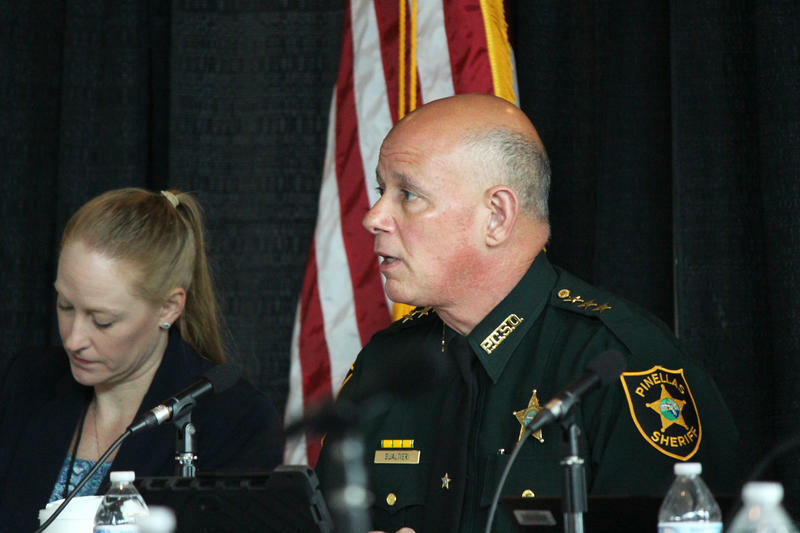 Pinellas County Sheriff Bob Gualtieri is chair of the Marjory Stoneman Douglas High School Public Safety Commission, which met Tuesday at the BB&T Center in Sunrise. Broward County school officials still don't know whether the confessed killer of 17 people at Marjory Stoneman Douglas High School on Feb. 14 attended a controversial disciplinary program after he was referred to it for vandalizing a bathroom in 2013. The Broward school district — which is the second-largest in Florida and sixth in the nation — lost track of Nikolas Cruz for a few days in late-November and early-December 2013, when he was supposed to attend the PROMISE program at Pine Ridge Education Center in Fort Lauderdale. PROMISE allows students who commit certain misdemeanors to receive counseling at an alternative school rather than possibly facing suspension or arrest. But the chair of a state panel tasked with investigating the shooting said what actually happened five years ago had no bearing on the events of Feb. 14. If Cruz had been arrested instead of being routed to PROMISE, there's no reason to believe he would have been prohibited from later purchasing the gun he used to shoot 34 people at Stoneman Douglas, Pinellas County sheriff Bob Gualtieri concluded. "It would never ever have affected Cruz’s legal right to buy, own or possess a firearm," Gualtieri, who leads the Marjory Stoneman Douglas High School Public Safety Commission, said during a meeting at the BB&T Center in Sunrise on Tuesday. "If there’s any question as to whether this had any impact on that, it absolutely did not or could not have." After the shooting, there was a public outcry against PROMISE, which some teachers, parents and students said was an example of lax discipline policies in Broward that they argued let students get away with serious crimes at school. Gualtieri called the pushback against PROMISE a "rabbit hole" and a "red herring." The commission ultimately approved a few recommendations regarding pre-arrest diversion programs at schools. Members voted to suggest that there should be a maximum number of chances a student would get to participate in pre-arrest diversion programs. They also want schools to be required to report data regarding their diversion programs to the Department of Juvenile Justice, so students' behavioral problems can be tracked if they transfer from one district to another. The suggestions will be included in a final report to the state Legislature, due early next year. In response to WLRN reporting in May, the Broward school district admitted that Cruz had been assigned to attend PROMISE five years ago, while he was attending Westglades Middle School. That was after Superintendent Robert Runcie said for months that Cruz had "no connection" to PROMISE. The state investigative commission’s extensive review of Cruz’s relationship to PROMISE was inconclusive. That's largely because of the school district's duplicative and incomplete records. In 2013, which was the first year the PROMISE program was in effect, the Broward school district used two separate electronic record-keeping systems to track attendance. At traditional public schools, teachers marked students absent, and the rest were marked present by default. At Pine Ridge, the alternative school, attendance was tracked manually. But the two systems were not integrated, and users of one did not have access to the other. Cruz was referred to a three-day stint at PROMISE after damaging a faucet in a boys bathroom at Westglades on Nov. 25, 2013. The next day, he was marked present at both Westglades and Pine Ridge. "Cruz obviously could not have been in two places at once, but the district is unable to determine where he was on November 26, 2013," according to a Florida Department of Law Enforcement report presented to the commission on Tuesday. Pine Ridge prepared intake documents for Cruz on that day, and investigators found that the information on the forms was consistent with Cruz’s circumstances at the time. But the person who completed the documents doesn't remember whether she interviewed Cruz personally. It's possible she interviewed him over the phone rather than in person, which means he might not have been physically present at Pine Ridge that day. Transportation records don't shed any more light on where Cruz might have been. Then, there was a break for Thanksgiving. Cruz was supposed to go back to PROMISE on Dec. 2 and 3. On Dec. 2, he was marked absent at both Pine Ridge and Westglades. And on Dec. 3, he was absent at Pine Ridge and present at Westglades. But investigators can't say for sure whether he was actually at either school on those days. The most pertinent questions regarding Cruz's involvement in PROMISE are whether he should have been arrested instead of being referred to the alternative school, or if he should have been arrested when he didn’t show up at the alternative school. More importantly, investigators considered: If he had been arrested, could that criminal record have kept him from buying a gun later on? Gualtieri said no. If Cruz had been arrested for the vandalism misdemeanor, he likely would have been referred to a Department of Juvenile Justice diversion program for first-time offenders and ultimately received community service as a punishment. He also would have been released to his mother rather than being held in juvenile custody. Gualtieri said the inconsistency in Cruz's records was an anomaly. Further, he said investigators' review of the broader history of the PROMISE program since its inception turned up relatively few problems. "We have uncovered nothing where somebody was inappropriately referred to PROMISE," he said. Gualtieri said he was ready to conclude that the PROMISE program was not a contributing factor to the shooting. Some members of the commission agreed. Florida Department of Children and Families Secretary Mike Carroll said programs like PROMISE help keep young people who make minor mistakes out of jail, and he doesn’t want to see them dismantled. Other members were more skeptical. Melissa Larkin-Skinner, CEO of Centerstone Florida, a mental health treatment facility, said there may have been a missed opportunity to rehabilitate Cruz, since it appears he did not receive any help from the PROMISE program as intended. Max Schachter, whose son, Alex, was killed in the shooting, was more blunt. Addressing a representative of the Broward school district, Schachter said: "You weren’t helping him. He got progressively more violent. The system just failed him." As far as Gualtieri is concerned, the commission's conversation about PROMISE is over. But Schachter said "there are a lot of problems" with PROMISE and other ways the school district handles students' misbehavior that officials need to address. "We are going to come after those people that made this happen and did nothing," he said, "and they're going to be prosecuted and held accountable."